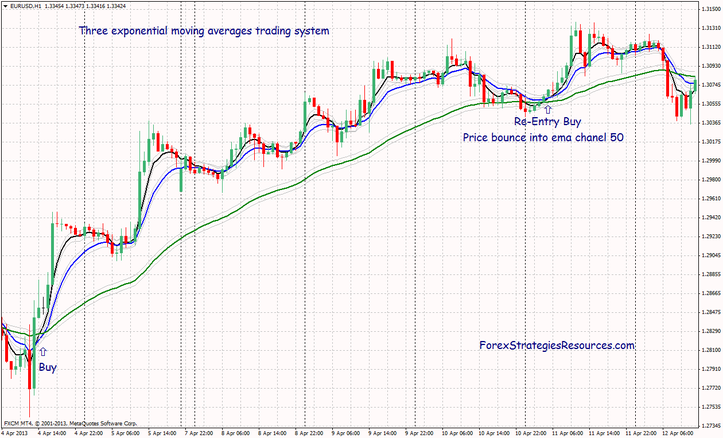 This trading system is a trend followin strategy based on three Exponential moving averages with levels (50 and -50). I have add also a filter: WPR Slow indicator but it is optional. 1.EMA50 and EMA11 are both pointing up. 2. EMA5 is above EMA11. 3. EMA11 is above EMA50. Re-Entry wait for the price to fall back, and touch the EMA50. Filter optional:( Wpr slow indicator confirmed with red bar sell signals). Stop Loss: We place a protective stop loss at -40 pips. Profit Targets: When we have 40 pips in profit we exit one lot. stop of 40 pips ,we move stop loss to 40 pips. 1. EMA50 and EMA11 are both pointing down. 2. EMA5 is below EMA11. 3. EMA11 is below EMA50. - Stop Loss: We place a protective stop loss at -40 pips. - Profit Targets: When we have 40 pips in profit . stop of 40 pips . Re-Enter long o Short when the price bounce 50 Exponential moving average channel. 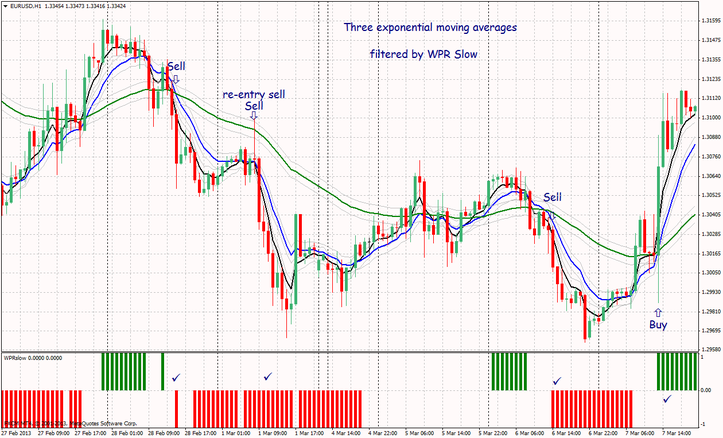 This trading system is a trend following strategy based on three Exponential moving averages with levels (50 and -50). I have add also a filter: WPR Slow but it is optional.